Small Solutions, LLC is all about bringing small solutions to small problems to prevent them from becoming big problems; that’s why we offer air duct zoning as a service. Air duct zoning allows us to work with you in figuring out how to precisely control the temperature in each room. How Does Air Duct Zoning Work? Air Duct Zoning is simply a way of dividing your home into areas with similar heating and cooling requirements. Every home has at least two zones; the living area and sleeping area, which are seldom used at the same time. Others are typically divided between upstairs and downstairs, master and kids bedrooms, formal living room, dining room, family room and kitchen. Each area is often occupied at different times and has different heating and cooling loads. Air Zoning is accomplished by using automatic dampers in the ducts in each zone. Each zone is controlled by a thermostat that controls it’s damper, and the heating/cooling unit provides conditioned air only to those required zones. The dampers to the zones that are satisfied will close, saving energy. Automatic setback thermostats allow you to program each thermostat to reach different temperatures during various times of the day. It’s simply not possible for one thermostat to provide ideal comfort in every room. What’s comfortable for the bedroom may be too warm for the family room. Air Zoning offers the easy, affordable, economical solution. Air Duct Zoning divides the house into areas with similar heating and cooling requirements with each zone being controlled by its own thermostat. The result is total comfort, no matter where you are inside your home, heating or cooling only the rooms that are needed, and wasting less energy. Energy Savings You Can Bank On! 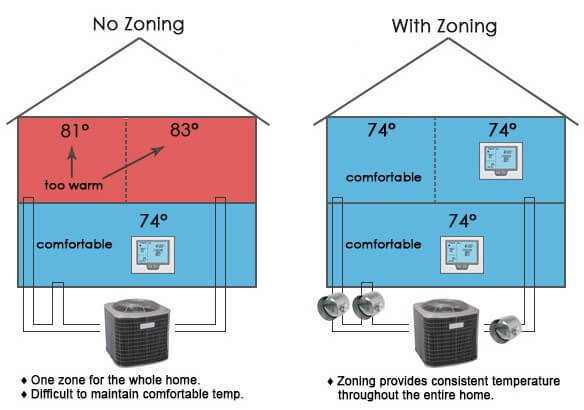 By heating or cooling only those rooms you’ll be using, Air Zoning absolutely allows you to conserve energy. Consider the alternative in most homes, whereby one thermostat controls the temperature of the entire house; rooms not in use are needlessly being heated or cooled thus wasting energy and costing you money. An old wise tale says to leave your thermostat set and maintain a constant temperature continually, which is untrue. It cost much less to heat up a cold house where the thermostat has been off than to leave the setting the same all the time. This also goes for cooling. Always shut off the heating or cooling in areas not in use to maximize energy savings. The energy savings with Air Zoning can exceed 30% when optimally operated. This kind of savings exceeds any savings derived from upgrading to higher efficient equipment. However, to realize energy savings in excess of 40%, it is suggested that you install programmable thermostats in each zone and upgrade to high efficient equipment. Contact Small Solutions, LLC to discuss what your particular comfort challenges may be. Often in only minutes, we can determine whether a zoning system might be right for you. While we are there, we will share the many comfort and money-saving benefits of air zoning. Our visit and consultation are both completely free. And we’re decidedly low-pressure about “selling you” on the systems that we carry. 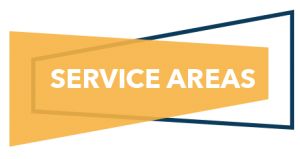 It’s just our way to help you explore and solve your zone-based comfort problems in the ways we know will work best for you. Small Solutions, LLC looks forward to providing you the Air Zoning system that will definitely help you attain energy cost savings!